So you are headed to Hell’s Kitchen, well good for you – don’t let the scary name stop you. What was once a steam pit of organized crime and tenements west of the navigable city is now a destination for great food, nightlife and the arts. Hell’s Kitchen boundaries are dotted with new and architecturally interesting sites, such as the north end of The Highline, Hudson Yards and the Javitz Center to the west, a marvel of modern architecture. Thanks to its location near Broadway, Hell’s Kitchen draws a crowd of the culturally inclined as well as the many artists who make it their home base. Plan your day carefully, and you won’t be disappointed by all the neighborhood has to offer. Ease into your Hell’s Kitchen crawl with a first stop somewhere sweet. Donna Bells on 49th street is a bakery co-owned by Pauley Perrette, NCIS’s quirky character Abby Sciuto, in honor of her late Southern mom. Flaky southern biscuits or Mississippi mud bars go exceptionally well with coffee. Take a stroll across the neighborhood, which is known for its industrial-esque construction and prevalence of bodegas. 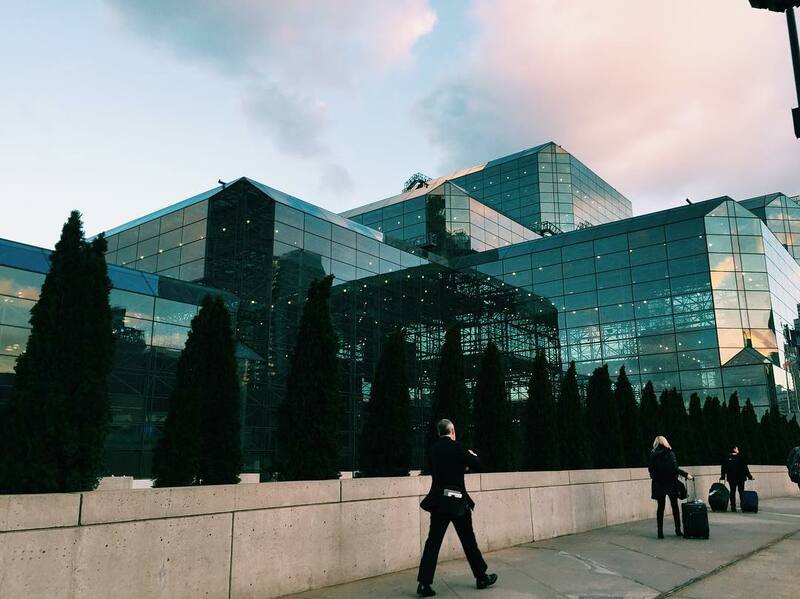 It’s worth walking across to the river to take in views of the water and the enormous glass-encased Javits Center with its 7-acre green roof, where trade shows on everything from babies to boats descend each year. Next, enjoy a cultural stop: Alvin Ailey Dance School. The school is known for training elite performers, and performances are held frequently. Or participate in one of the many civilian classes and get a taste of the fun for yourself. When your appetite warms up, choose from one of the neighborhood’s destination restaurants. Esca on 43rd is known for its ethereal crudo and creative fish dishes, or get your fingers sticky with Daisy May’s delicious barbecue ribs. Then head to a wine or beer bar. Ardesia, on 52nd, is a sleek spot where you can revel in a list of global wines and bar bites from the beloved tapas spot El Qunito Pino. The Pony Bar on the other hand, is an old-school pub where you can choose from dozens of American craft beers. Ready to move on to some happening nightlife? Participate in the quintessential Hell’s Kitchen nightlife scene at Flaming Saddles Saloon, a honkeytonk gay bar where everyone gets their groove on. Or get your into your house vibe at Fairy Tale Lounge, a DJ-fueled disco-ball go-go boy dungeon. When at last the night should end, don’t miss some of the best tacos in the city at Tehuitzingo on10th Ave at the back of a Mexican deli.